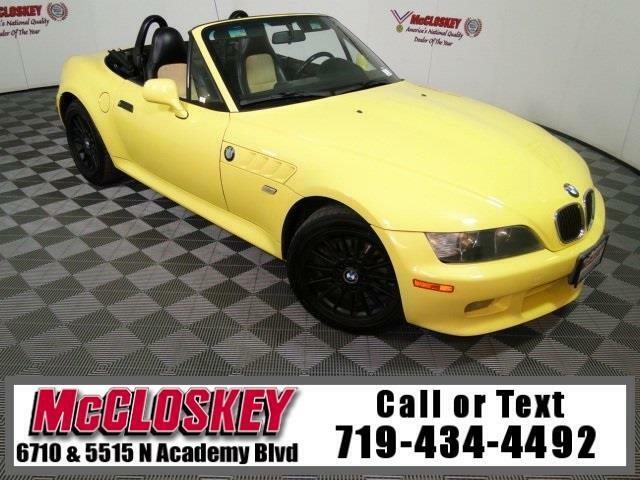 Luxurious and sporty 2001 BMW Z3 3.0i with Convertible Top, Harman Kardon Sound System, Keyless Entry, Leather Heated Seats, Manual Transmission, and Impressive 3.0L I6 Engine! All Z3s have a leather-wrapped M-Technic sport steering wheel and standard Dynamic Stability Control, which senses when the car is veering from its intended path and selectively modulates engine torque and the antilock brakes to bring the car under control. With superb steering and excellent brakes, any Z3 is fun to drive and own. Slotted comfortably between the bargain Mazda Miata/Toyota MR2 and more expensive machines from Mercedes-Benz and Porsche, there is a Z3 to suit anybody's needs. This vehicle passed our 110 multi-point inspection and is backed by our National Quality Dealer of the Year Award. We are an ''A+'' Better Business Bureau Rated Business. We offer low interest rate financing, low down payments and the highest trade allowances in the state! Here at McCloskey we do things a bit differently, we shop our competition every day to ensure a great value to you. Come on down and experience it for yourself. This McCloskey Assured vehicle includes a Vehicle History Report!! At McCloskey we strive to provide ASSURANCE, TRUST, VALUE AND QUALITY! Call 719-434-4492. Message: Thought you might be interested in this 2001 BMW Z3.